Our recent weekend in Evanston was planned to coincide with the American Craft Expo, sponsored by the Auxiliary of Evanston & Glenbrook Hospitals to benefit ovarian cancer research. Our three kids were born at Evanston Hospital, and my maternal grandmother and several friends lost their lives to ovarian cancer, so those aspects added special meaning to this benefit for me. I took no photos at the show (not even sure if I could have, but bringing a camera just didn't feel right) so all photos below are images from the artists' promotional materials or websites. We arrived Saturday morning at 10 when the doors opened. You always need a browsing strategy for big shows in order not to miss anything, and ours was to start at the back and work our way forward, row by row. Seeing all 150 artists took us 4 hours, and revisits took an extra hour. Fiber artist Sandi Garris. Very inspiring use of color & form, in both her geometric & organic styles. Her pieces are made of hand-dyed cottons, machine stitched, then mounted & framed. Fiber artist Renee Harris. Love!!! My first time seeing her work in person, after admiring it online for years. Photos just don't do justice to her pieces. Fabulous textures & mixing of paper, cloth & stitches, beautifully framed. Glass artists Peter Muller & Joe Peters. These sea creatures are created by Joe's borosilicate torchwork, while the portal bowls framing them are furnace blown and then cut and shaped by Peter. Incredibly detailed work. A perfect collaboration. Ceramic artist Rick Hintze. We especially liked his earthy matte/crackle glazed vessels, but I couldn't find a photo of those. Great shapes and textures. Basket artist Jennifer Heller Zurick. She harvests Black Willow bark and completely processes it herself. She then weaves it free-form into baskets, large and small. Extremely appealing pieces, very warm and intricately patterned. Fiber artist Sally Jones. Sally had beautiful hand-screened silk tops and scarves. 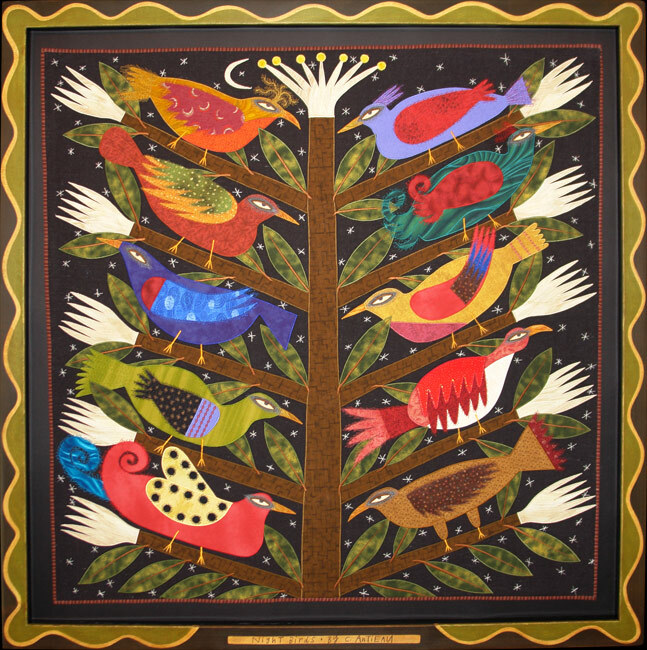 My favorite style isn't shown on her website -- her block-pieced silk scarves featuring 5 or more colors/patterns. She had sold out of the color group I liked best, and offered to custom make one for me. Ceramic artist Larry Richmond. His work combines pottery with fiber and wood accents. Beautiful shapes, patterns and textures. Jewelry artist Deb Karash. Deb is one of my all-time favorite artists. 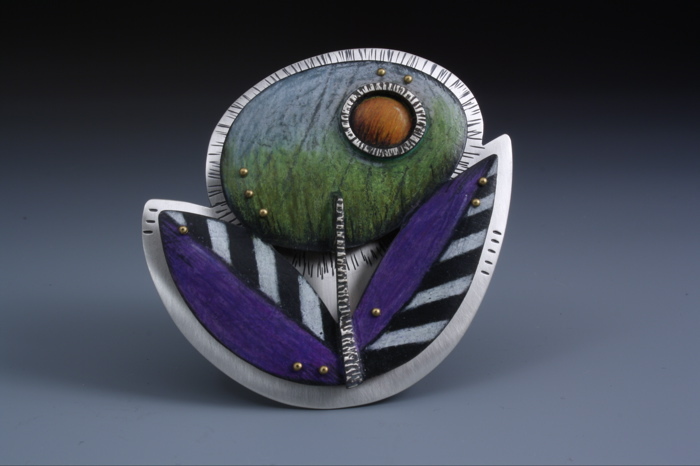 She's developed a process in which she applies layers of Prismacolor pencil to a patinated copper shape, seals it, and then mounts the colored piece with brass rivets to a textured sterling silver backdrop. Her pieces have all the elements I love -- a fanciful take on nature, distinctive hand-coloring & shading, a mix of metals, beautiful forms and impeccable finishing. Fiber artist Chris Roberts-Antieau. This was the first or possibly second time I've seen Chris's work in person -- she may have exhibited at a Reston/NoVA Fine Arts Festival some years ago. Anyway, her "Night Birds" above is one of our favorites from Chris's strange and wonderful show collection. As with many fiber artists' work, photos don't do justice to the texture created by embellishment stitching on her pieces. Wood artist Janel Jacobson. Her tiny netsukes and other small wood carvings are so lovely. 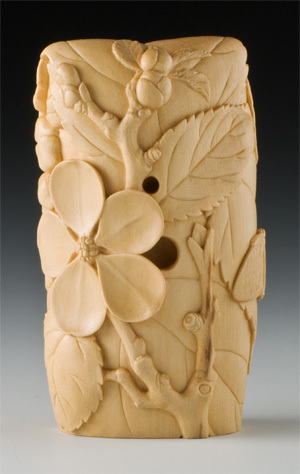 Spring Song, the piece pictured above, measures only 2.2 x 1.3 x 0.8 inches. Incredibly tiny details! ACE was truly an inspiring and memorable show. We spoke with many of the artists, who were eager to share information about their inspiration and their methods. What struck me over and over was the importance of layers in artistic work. The ability to think in and conceptualize the layers or stages of a creative process. The use of physical layers of raw material in the construction of the work itself, whether glass or fiber or whatever. The layers of meaning that the piece holds for the artist as maker, versus the public as viewer/ enthusiast/ buyer. The layers of past, present and future connected by evolving craft traditions and techniques. So, fellow fabriholics, have any of you tried Spoonflower yet? Anyone who's been reading here for awhile may have noticed that my mixed media and fabric projects frequently feature a black and ivory/tan striped element as a unifying accent. You'll find it on my pillows, my bags, and my collages. I've searched online and in every local fabric store. Finally, that very slooooow lightbulb went off in my brain. The design is great; a (seemingly) simple black and ivory stripe. This first try came out a bit more yellow than ivory (these pictures don't really show the true yellowish cast) but it's definitely quite useable. The fabric quality looks excellent. I expected to have to do some color-and-scale tweaking to get it right, so I wasn't at all disappointed about that. Overall, I'm thrilled to know that when I need a specific fabric design, I can work with Spoonflower to get exactly what I need. With more experience, I think I'll even be able to get it right the first time. I've already submitted my second stripes order, with adjustments to scale and color from this first order. And this time I felt so confident, I ordered 2 yards, although they permit you to order a small swatch or a fat quarter. I will say that I don't find Spoonflower's current design/ordering setup entirely clear or accurate; there are some strange dpi-related scale/dimensional aspects that I still don't entirely understand. That part needs to be made even more user-friendly. But hey, it's getting there, and eventually the Spoonflower design possibilities for all of us will be simple and endless. I've got two great new books to help get some fresh creative juices flowing. The first book is Collage Lab by Bee Shay; it contains 52 different collage/mixed media technique "labs"; a person more disciplined than I am might try working through the book, one lab per week, as a year long project. And that would probably be a great learning exercise. But I bought this more as a technique-specific reference and a source of visual inspiration. And if you follow popular mixed media blogs or magazines, you'll recognize many of the artists who have contributed their beautiful work to this book. The second book is 500 Art Quilts, a new member of Lark Books 500 series. I rarely attend big quilt shows, so I rely on books for exposure to what's happening in the art quilt world. This book is full of eye candy and happily, I didn't recognize too many of the pieces as reruns from other books. It's wonderful to have such a diverse collection of art quilts gathered together. One inclusion of special note is Judy Coates Perez's amazing Moon Garden painted(!) wholecloth quilt, featured in front, back and detail views and as the photo on the back flap. Congrats to Judy and all the artists included in this great little book. So much inspiration in one compact volume! As I was recently browsing through last year's Calypte Anna photos, I came across this one. It was an instant favorite for me the day I took it. Don't the babies look like they're having a heart to heart chat, or maybe sharing a bit of hummer gossip? First, I cropped the image a bit and used the cloning tool to magically remove all those unsightly "dirty diapers" by covering them with cloned patches of branch, sky or nest. I saved this as a new image (thus keeping my original photo intact). The new image became the background layer for experimentation. Next, in the layers menu, I created a duplicate layer, and on that I used a filter called "accented edges" to create some outline highlights. Once that was done, I duplicated that layer and then used a filter called "paint daubs" to soften and texture the image. Again, I duplicated that layer, and then adjusted the contrast. Finally, I duplicated that layer and used a filter called "grain - regular" to add a bit more texture, and I adjusted the color saturation (which probably should have been done in yet another duplicate layer, but I forgot). All these layers create a large file, but it allows the flexibility to revert to an earlier stage and then experiment with different subsequent choices. It also enables you to adjust the opacity (see-throughness) of each layer, which can also create interesting effects. In this case, each new layer contained the cumulative effects of all previous layers, so ultimately I could delete all the intervening layers once I was happy with the final layer... unless I'd ever want to use one of those middle layers as the basis for a new project. (I admit, I'm a layer-saver.) But as a layered image, this takes up about 6 times as much storage space as a non-layered image. I'm not sure yet what's to become of this image, but I did notice that it goes nicely with the fabrics in my blue/purple quilted pillows. I enjoy visiting Anthropologie stores every now and then, just to soak up some of the abundant creativity evident in their displays, especially their home decor. You can usually expect to find the unexpected there, but these birds are a special treat. Isn't this just irresistible? I love the expressiveness the artist achieved through the curve of the bird's neck, the tilt of its head, the seemingly inquisitive eyes. Heaven knows what clever engineering lies beneath the surface, as these birds are freestanding creatures. Their plumage seems to be made entirely of old book pages and blank newsprint. It demonstrates the power of a simple concept when beautifully executed on a grand scale. So I'm curious whether similar creatures may be inhabiting other Anthroplogie locations... if you have a store nearby, go check it out. And if you can, take some photos and share! P.S. Further adventures with paper -- did you see Project Runway last night? It was a great challenge. Christopher's design was my favorite. Once again we're off to Virginia to visit our boys, this time to celebrate the 25th birthday of son #1 and the beginning of our wonderful family adventure. An antelope squirrel scavenging bird seed on the back patio. A rare visit from a male black-headed grosbeak, enjoying a snack under the shade of the patio table. Doves on the back fence, catching up on the morning's gossip. Out front, little tough guy still guards his territory most afternoons. Geninne Watercolors Part 1 from Geninne D. Zlatkis on Vimeo. 2. Susan Hinckley's latest masterpieces, here and here. 3. The amazingly prolific Rita's modern take on classic patchwork, here. If you have any interest in mastering eraser stamp carving, this 10 minute carving demo video from Geninne is an absolute gift! It's such a pleasure to watch. 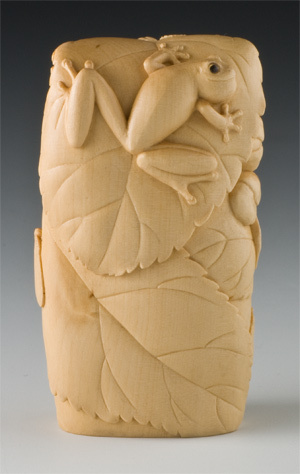 Geninne's work prompted my recent eraser carving efforts, and she continues to inspire me with her many artistic talents. A teeny but important note: Geninne is obviously very skilled and comfortable with her carving tools, which have very sharp blades! If you're a beginner, or if you're a certified klutz (like me!) then please be sure to always carve away from yourself & your precious fingers, to avoid any unpleasant accidents. On May 5, each collage will be available for a minimum donation of $80. On May 6 & 7, the remaining collages will be available for a minimum donation of $40. The goal is to raise $20,000 for ACS through this event. It's a great opportunity to own a piece of original artwork and help a very worthy cause all at once. Each collage is sized or premounted to fit into an 8" x 10" frame. So if you have a few minutes, please go take a look! There's lots of creative inspiration to be enjoyed, in honor of the many people whose lives have been touched by cancer. And hats off to artist Virginia Spiegel and friends, for organizing and conducting such a worthwhile event. So I didn't finish that second collage in time for Collage Mania; and honestly, in the end I wasn't sure I would have submitted it anyway. It's just so different than what I usually do, and though I really like it alot, I'm still absorbing it. So despite it being a personal favorite, this photo has pretty much languished on my hard drive until now. For this collage, I Photoshopped it a bit to add some speckly texture and discoloration and the blurred border. Then I printed it on Epson matte photo paper, to which I fused Heat'N'Bond Lite on the back side. The CAUTION background was created in Word, then pasted into Photoshop (mine is just an Elements version), resized and recolored to suit me, then printed on inkjet fabric. After rinsing & heatsetting, I fused it to stiff Peltex. Then I fused the trimmed paper photo to the inkjet fabric background, deiberately slightly off-center. For the border, I printed another sheet of inkjet fabric with black stripes. (For this cool idea of a fused binding, I credit Judy Coates Perez.) After rinsing and heatsetting, I fused Heat'n'Bond Lite to the back and cut it into 1+1/4" strips to fold and fuse onto the border of the collage. Then I machine stitched this fused "binding" with red thread to add detail. I'd already printed the faux fortune cookie "beauty" message on white matte paper, so I simply machine stitched it into place with the red thread through all layers. The small grommets in the photo corners were added last. I still have to decide how to back or mount it, but the design part is done. I think. We'll see. As happy coincidences go, we're heading back to our old Reston stomping grounds this weekend. John has a law school alum event at the U.S. Supreme Court on Monday, so with an extended weekend visit, we'll get to see our sweet boys and our dear old friends and our beloved old haunts in northern Virginia. We spent 17 lovely growing-family years there, so it will be quite a trip down memory lane. And if I get the chance, I'll go and see if that morning glory is coming back again this year.